How Do I Make Money by Investing in Mutual Funds? At least, you must know the what, why, & how of mutual fund investment! Hello Investors! We are back with the basics to brush-up your knowledge of mutual fund investments. It is very important for an investor to know the what, why, and how of any financial instrument before deciding to invest one's hard-earned money into it. Because, most of the time it happens that investors who deploy their money in any financial instrument are unaware of the basics of it, and later on they regret due to failure in earning adequate returns from it. To prevent you from any kind of loss, we are here with this blog about the basics of mutual funds. The mutual funds can be referred to as an investment junction for the investors who do not want to expose themselves directly to the stock or security market. Here, a pool of money is deployed in the predetermined securities such as stocks, bonds, money market instruments, etc. Mutual funds are managed by experts who are known as fund managers, and they are responsible for investing the money in the various securities in the right time so as to fetch higher benefits on investment. There are a lot of features of mutual funds that attract the attention of the investors. Some of them are low cost, liquidity, easy handling, diversification, etc. Diversification and low cost are the two major aspects which help the investors to attain profits from a low-risk investment. You need not timing the market, unlike stock market trading. Diversification is one of the biggest powers of MF investments as it helps in cutting down the risks. It’s easy on your wallet as through SIP process you can even start with Rs. 500 per month. The variety of categories help you to choose the funds as per your investment objectives. Thus, you can make more refined investments to attain your financial goals. Liquidity is one more factor which attracts the investors. This helps in easy redemption of your invested money. The expert fund managers manage the schemes. Even a naive can invest and create wealth. There are other benefits of investing in mutual funds that make your entire investment journey effective and efficient. Moreover, when you invest in them online using the best online portal like MySIPonline, it adds efficiency to the process. You can access your mutual fund investment account at any time from anywhere using your smart-phone or laptop. Investing in mutual funds has become extremely easy in time as the technology has upgraded. One can invest either online or through intermediaries such as banks, brokers, or agents. However, in today’s time, the online method is mostly opted as it comes with a lot of added features like any time access to the account. To get started with the investment in mutual funds you need to be KYC compliant. Don’t get scared if you have no idea about it. It’s just a formality of completing documentation so that you can create an authenticated investment account. Once you get your KYC done, you can start your investments. But, you need to be cautious about one little thing before selecting any scheme to invest in, which is to ensure that you’ve chosen a suitable plan as per your objectives and not on the basis of any other tempting factors. Besides, there are professionals who can help you in choosing the right scheme as per your financial goals; you can take help from them too. 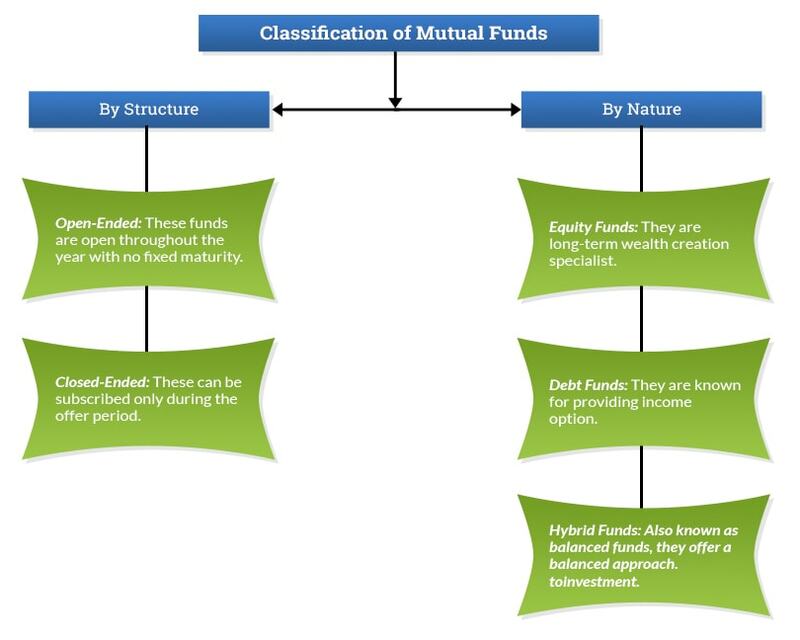 MF schemes are categorized into various types based on their investment type or nature, and the major ones of them are Equity, Debt, and Balanced funds. Other than these, there are more such as Exchange Traded Funds (ETF), Fund of Funds (FoF), Liquid Funds, etc., and you should select them as per your requirements. You can make a healthy investment portfolio by bifurcating your capital into various categories of schemes in required proportion. Capital Appreciation: Your investments keep on gaining value on principal over time when you invest in growth plan of a mutual fund scheme. It is beneficial in long-term wealth creation objective. The return on your investment gets added back to the value automatically. Thus, each time when the scheme performs well the value of your investment get increased by adding up to its NAV value which let you fetch benefits at the time of redemption. Income: When you invest in the dividend plan of a mutual fund, you are entitled to receive some portion of the profits as a dividend on investment typically on a yearly basis. Although it is beneficial for the investors who require an income option, it eats up the chance to create long-term higher benefits. In today’s time, a mutual fund is a buzzword in the entire investment industry. But, still, many retail investors are facing difficulties in maintaining a well-diversified investment portfolio with minimal risk because of the constraint of time & money. Of course, it is always said that investment in mutual funds require no expertise but still, when professionals are there for you to help you attain better portfolio, then you should consult to them for the best shot.